grandma's cookie jar: crafting with grandma - Snowflakes! Typically the beginning of January is very, very, very snowy here where I live, but this year we only have a little . . . and did not have any snow in December! So, whether you live where you have a lot of snow, a little snow, or no snow at all, the craft I found on Pinterest this morning is one you could enjoy making with your grandchildren! All you need is chenille wire, beads and ribbon. Pretty simple! Follow these steps . . .
Take your chenille wire, fold in half and cut. Take three pieces, twist the middles together. Spread out the chenille wire ends. Have your grandchildren string beads on each "arm" of your snowflakes. Twist the ends to keep the beads in place. Tie a ribbon loop around the bead closest to the end on one "arm" of your snowflake. 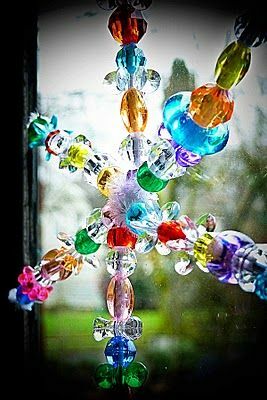 Enjoy making snowflakes - your grandchildren could give them to their teachers, the secretary at school or church, their pastor, their neighbors or take them to visit a shut-in and leave a pretty snowflake hanging in their window! What might you encourage your grandchildren to do with the snowflakes they make?